If you have ever started to learn a foreign language you have likely realized quickly that you need to learn vocabulary and grammar regularly. Failure to do so can mean that you cannot follow the class anymore which would be disastrous obviously. But even if you are learning alone you want to learn that language regularly to avoid having to start all over again if to much time passed by. Open Teacher is a training tool that is especially useful for learning new languages but capable of more than that. The open source software supports the reading and writing of t2k (teach2000) and wrts files. These files can be imported in the application if available to begin learning right away. Users without those files need to add content to a database first. Words can be entered manually or pasted into the application window, that's helpful if text files are available that make use of the correct syntax supported by Open Teacher. Each question and answer has to be in its own text row separated by the "=" symbol. Once a set of questions and answers has been added it is time to add them to a test. This is done by selecting rows and clicking on enter. It is then necessary to switch to the Teach me tab which offers learning test configuration options. It is for instance possible to change the question or lesson order, the lesson type and one of four available test types. 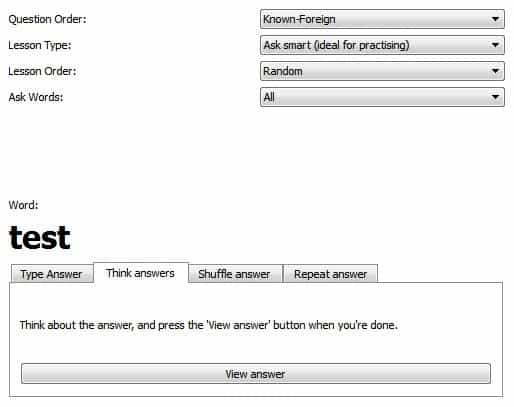 Available tests include direct answers or shuffled words that need to be identified first before they can be translated. The created word listings can be saved or printed. Open Teacher is available for Microsoft windows, Apple Mac OS X and Linux. Downloads and documentations are offered at the developer homepage over at Sourceforge. This is very useful tool for learning Other langauge.But little bit difficult for unknown user to maintain database. 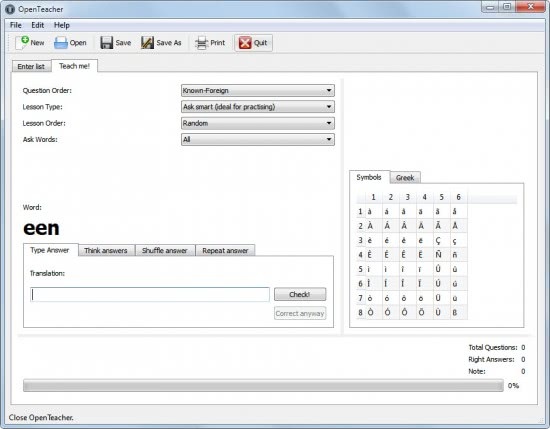 But over all very excellent GUI tool for unknown user. Great tool for apple! I’m really happy with it. But I don’t know if it is my mistake, but there seems to be something odd with the score you get. I got 19 out of 20 correct, and it said I got 88%. A bit earlier I scored 8 out of 9 and it said I got 72%. It’s just a detail, cause it’s a very useful program.